The diagram demonstrates how air circulates through the Austin Air Cleaner in the filtration process. 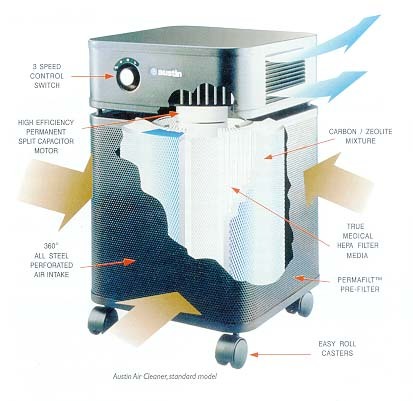 Shown is the Austin Air Cleaner standard unit with the superquiet permanent split capacitor motor. Air enters 360 degrees from the surrounding room. Behind the steel outer grill lies the fibrous FERMAFILTtm Prefilter, which traps large airborne particles like dog and cat hair. The air then passes into the filter drum. It first passes through the packed carbon material, removing gases and odors. Then 80 square feet of pleated true medical HEPA medium removes sub-micron particulates, the contaminants most injurious to health. Pure clean air is finally expelled by the centrifugal fan in one direction from the louvered top deck. This one directional air flow from the unit avoids contaminant-laden floor areas, and allows the air flow to be directed at will. Traps large dust particles, pet hair, etc. Manufacturer offers 30-day money-back guarantee, exclusive of shipping costs. Manufacturer offers 30-day money-back guarantee, exclusive of shipping costs.